In his book, Obrador denounces Trump’s budget proposals as moving money from housing, transportation, education, heath, justice, agriculture, development, and environmental protection to the military. Already he’s ahead of most Democrats who have pretended Trump was “cutting” the federal budget and acted as if the military didn’t exist. Obrador goes on to blame this shift in priorities for the poor quality of life in the United States in comparison with Ireland, Norway, Sweden, Iceland, Denmark, Italy, and Spain. Despite peppering his book with such “nobody’s been held accountables,” Obrador also includes an Obamesque promise of immunity for all crimes due to the importance of looking forward. Yet most of his book could never be called Obamesque. He begins with a discussion of what Obama would call “our founding fathers” or “wise Wall Street advisors,” but Obrador refers to the Mexican equivalents of these groups as “a gang of thugs.” And he names names, including those of many previous Mexican presidents and various Mexican oligarchs. 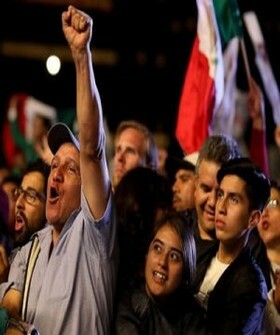 Obrador opposes the financial corruption of the Mexican government, and promises to abolish it. He also promises New Deal-style jobs and education programs, agriculture, tourism, a duty-free zone along the U.S. border, and the top priority of serving the poor, not the rich. He promises vast savings through the ending of corrupt benefits and contracts, as well as through steps to keep resources in Mexico. Rather than export raw fossil fuels and then re-import them refined, Obrador wants to refine them in Mexico. The new President of Mexico says that migrants die in the Southwestern United States just as in the Mediterranean, but that U.S. media has a preference for one over the other. His comments on Trump’s incitement of racist violence are equally honest. Obrador made many of these comments in speeches in the United States, from which the book is compiled. He has countless kind things to say as well as tough ones. Not only does he cite the example of Franklin Roosevelt’s New Deal in positive terms, but he even praises Woodrow Wilson as a global peace maker, omitting entirely his racism, his horrendous failure to shape a just peace at Versailles, and even his military adventures in Mexico. The United States should be subject to the treaties it is party to. The problem is that in the United States corruption has been normalized, while compliance with the rule of law has not been.